See where to go and what to do! 18.1.2019 - 27.1.2019 | Virtasalmen Viljatuote will be in Berlin, Germany for Grüne Woche fair. Check it out! 6.12.2018 | Shop and mill are closed. We are celebrating Finnish Independence Day. 23.11.2018 | Viljatuote's Black Friday! Great sales to come! Check it out! 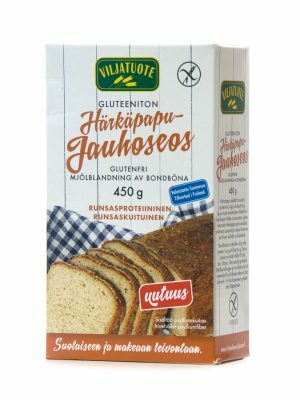 10.10.2018 | Now Viljatuote's webshop and recipes are in English. Have fun reading! 1.10.2018 | Virtasalmen Viljatuote has a new logo. Our business partners can download the new logo. Logo is here! 3.-9.9.2018 | Coeliac Week is celebrated all over Finland. There are also great deals coming from Viljatuote. Beware! 22.6. - 24.6.2018 | Shop and mill closed. Viljatuote staff is celebrating Mid-Summer. 10.5.2018 | Our shop is open today from 9 am to 3 pm. Welcome! 30.4.2018 - 1.5.2018 | Myymälä ja mylly suljettu. Hauskaa vappua! 30.3.2018 - 2.4.2018 | Myymälä ja mylly suljettu. Viljatuote pääsiäisen vietossa. 23.12.2017 - 1.1.2018 | Myymälä ja mylly suljettu. Vietämme joulua. 6.12.2017 | Myymälä ja mylly suljettu. Juhlistamme Itsenäisyyspäivää. 20.10.2017 | Myymälä ja mylly kiinni. Vietämme TYKY-päivää. 2.2.2018 | Gluten-free multi-seed crispbread is a delicious and healthy snack. 2/2018 | The production of vanilla and honey cereals has been discontinued. 11/2017 | Rice and corn flakes have been removed from our product range. 3/2017 | The gluten-free broad bean flour mix gives more protein and fibre to your baking.